Ventile® is a completely natural fabric made from cotton. 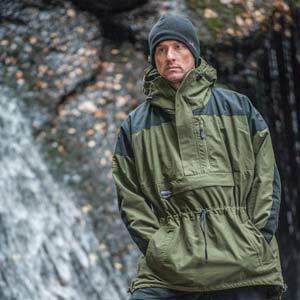 It is durable, highly breathable and quiet which makes it perfect for hunting, nature watching, bushcraft, nature photography and cold weather sports. Ventile® fabrics are 100% cotton, utilising the finest, long staple fibres, only found in the top 2% of the world's crop. After gentle spinning and doubling, the yarn is woven into a very dense weave, using up to 30% more yarn than conventional woven fabrics. The performance of Ventile® fabrics results from the properties of cotton fibres which expand when they come into contact with water. The combination of fibres, yarns and weave causes expansion in a uniform manner. This allows the interstices within the fabric to close up, preventing the further passage of water. In addition to this, Ventile® is impregnated with a high quality DWR system which enhances the fabric's water resistant properties and increases performance. Ventile® was invented just before World War 2 at the Shirley Institute in Manchester and was used in the Battle of Britain in pilots suits where it saved many lives. 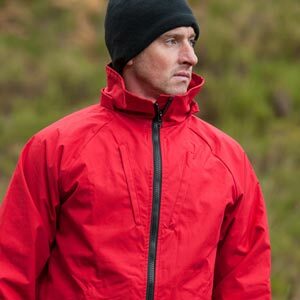 It was the first performance fabric used by mountain rescue teams in the UK and was used in exploring the world's highest mountain ranges and the polar regions before the advent of synthetic fabrics. Ventile®’s breathability performance remains unsurpassed. We have used Ventile® in our garments for over 30 years and offer four different fabric solutions Single Ventile®, Double Ventile®, Hybrid Ventile® and Cotton Analogy®.